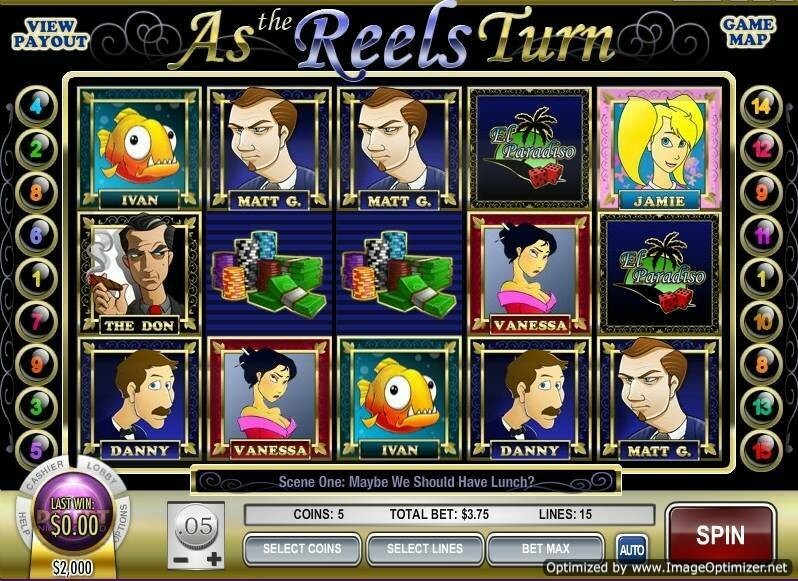 As the reel turn 3 is a 5 reel, 15 payline iSlot is a scene based game where you have many characters like Vanessa, Jamie, The Don, Matt G and Danny. This is the sequel of the previous islot As The Reels Turn 2. if you have played the earlier series you will already know all about iSlots. For the iSlot Novice, islot games are a unique type of story based slots where the player advances to the next scene as he plays the game. It is well worth watching this clip (View intro movie of as the reels turn) before you begin as it contains very useful insights. This game is based on the El Paradiso casino which is closely eyed by a Don and how the casino manager tries to protect it from his evil clutches. You will find two new characters in this slot. They are the charming Mrs. Livingstone and Pampers the cat. Pampers is a different type of icon that only appears during free spins. Pampers expands to cover the entire reel whenever it shows up on your screen. One of these Pampers symbols gets you a 2x multiplier and 2 of them get you a 4x multiplier. This game also has a "Scene Advancement" feature, which is triggered when 3 or more As the Reels Turn symbols appear on your screen. Each time 3 of these symbols appear the story advances to the next screen. The Danny Bonus Round is also triggered at this stage. As in the earlier parts of the series the graphics, animation and the sound effects play their part well to create an outstanding slot. It is recommended that since this is a continuation slot you also play As the Reels Turn 1 and 2 so that you really enjoy and reap the benefits of the entire series. As the Reels Turn 3 has been so popular with Slostjam visitors that it received the Best New Bonus Game Award 2008.